This is a Saguaro one of the largest of all cacti. It can grow to 15m high and its stem can be up to 60cm thick. 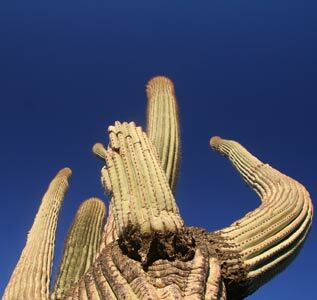 The name Saguaro sounds Spanish, but it actually comes from an Indian word. 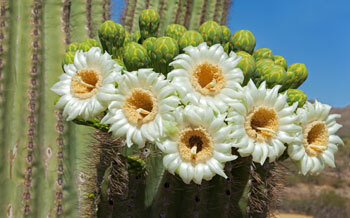 During May and June a large Saguaro might produce as many as 200 creamy white flowers, each one over 7cm across. Each flower opens during the night and dies by noon the next day. Each fruit may contain as many as 4,000 seeds. 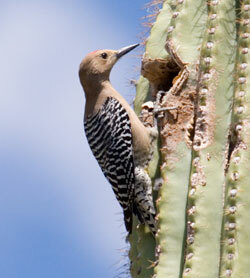 Two birds, the Gila Woodpecker and the Gilded Flicker will peck holes in the stem of the Saguaro to make their nests. Later these holes might be used by other birds such as the Elf Owl, which is about the size of a sparrow. The bird on the right is a Gila Woodpecker. The Saguaro is probably the biggest and heaviest cactus in the United States, but the very tallest is known as the Cardon cactus. This can grow up to 20m tall.